Made with a distinct blend of both performance style, this exquisite timepiece from Glashutte is uniquely identified by a different approach to watchmaking. The main dial and subdial occupy the left part of the dial, allowing for the distinctive moonphase design to take precedence, with a large date aperture also included for two distinctive ways to keep track of the month. Made with Glashutte Original automatic movement and secured with a grey strap for more comfortable wearing. 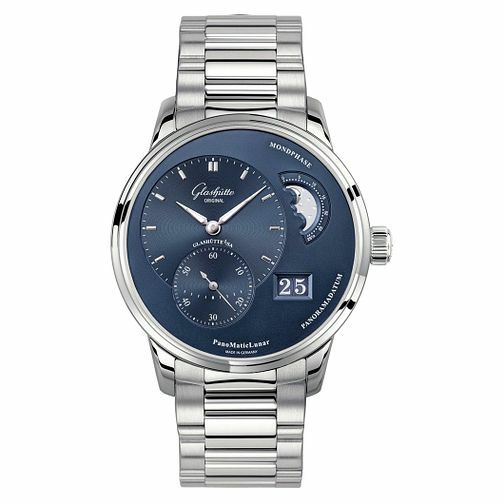 Glashutte PanoMatic Lunar Men's Moonphase Bracelet Watch is rated 5.0 out of 5 by 1.